This week, we have the latest real estate numbers for La Plata County for the month of December, which also gives the year-end comparison to last year. The attached charts show a detailed breakdown of several market segments in La Plata County, showing La Plata County as a whole, Durango In-Town, Durango Rural, Bayfield In-Town, Bayfield Rural, Ignacio In-Town, Ignacio Rural, and Durango Mountain Area. 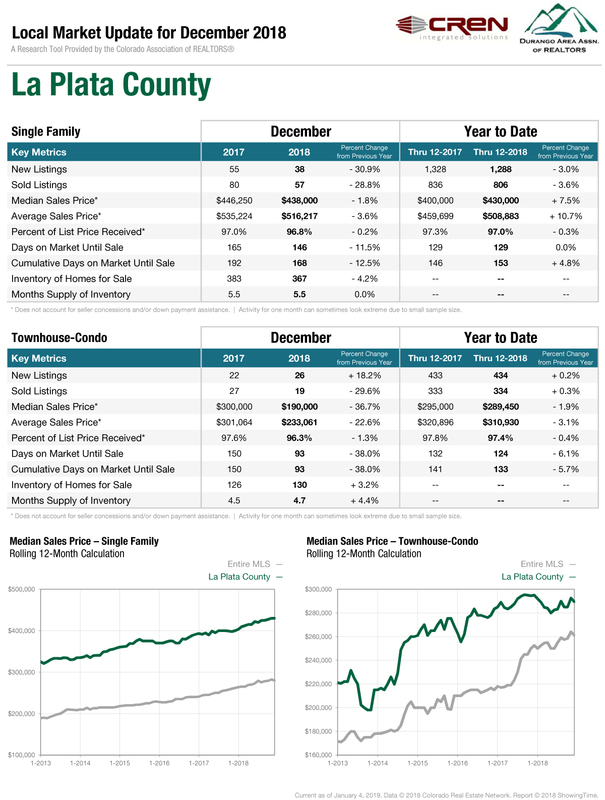 These charts indicate the statistics and key metrics for single family homes and townhouses/condos, including new listings, sold listings, median sales price, and more. They compare December 2017 to December 2018, and year to date information for both years. We also see the rolling 12 month median sales price for single family homes and townhouses/condos in these segments. We always appreciate these charts to be able to spot trends within our local market, and compare results to previous years. With December’s numbers, it is especially interesting to see how the year ended in each market segment. La Plata county single family homes had a slightly lower total number of sales through December 2018 than through December 2017. However, the median sales price was higher for 2018 than 2017. In the La Plata County townhouse/condo market, the number of new listings and sold listings were nearly even for 2018 and 2017. The median price was slightly lower in 2018 compared to 2017. Durango In Town single family homes had just a slightly lower total of sold listings for 2018 compared to 2017, and the median sales price was higher in 2018 compared to 2017. The townhouse/condo market had a small increase in sold listings, as well as an increase for the median sales price in 2018 compared to 2017. Looking forward into 2019, the year is off to a strong start already. We will definitely be keeping our eye on interest rates. In the 4th quarter of 2018 they hit highs around 5%, recently they dropped back down closer to 4.5%. Steady interest rates below 5% will help keep the market moving along at a good pace. Our prediction for this year is that the La Plata County overall numbers will be similar to 2018. Inventory under $500,000 will continue to be low, but we believe the median home prices will stabilize and stay very close to where they were in 2018. We will continue to see strong townhome and condo sales, along with a strong market for the homes in the $500,000 to $1,000,000 range. The luxury, $1,000,000+ market will be good, but again we are predicting this area of the market to produce similar numbers to 2018.